We are South Florida’s premier party bus rental service! We have served Ft. Lauderdale for over a decade and we have had the opportunity to have thousands of clients in that time. Our party buses and our service is second to none, and that is not a joke. We beat the competition in both price and service, not to mention that we have the best kids limo bus selection. 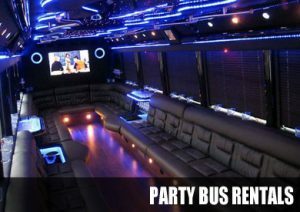 Please preview our party bus photos and party bus videos to catch a glimpse of what is available to rent. We have vehicles that can accommodate between 14 to 50 passengers in comfort and style. Some of our most popular requests are for weddings, kid’s birthday party buses, and proms! Take a ride in one of our luxurious and spacious party bus rentals for your special event or party today! Give us a call, or use our website to receive an instant quote quote or to make a reservation. We have had the humbling opportunity to leverage ourselves as the largest and most affordable party bus service in South Fla, providing you with superior quality of both vehicle and service. Your satisfaction and enjoyment are our top priority, and this practice has afforded us an A+ rating with the Better Business Bureau. We have an untarnished history of providing reputable party bus service in Fort Lauderdale. For your next special event, celebration, or party, there is no better choice than to use one of our premium limo buses! Are you celebrating a birthday? Why not bounce around Las Olas Blvd? There are dozens of little shops and restaurants along the blvd. Several places to get chocolates, desserts, or a gelato. The area is vibrant and there are plenty of people to talk to and there are several art galleries to stop in and look around. Are you and your friends going for a night on the town? Then hop in the party bus and let us take the party to your doorstep. Dance, sing, drink, and party all the way to the venue and all the way back! Let us take you to the Living room Night Club, where you can dance, drink, and party in a fun and inviting atmosphere! Perhaps you are visiting and you an your friends would rather go sightseeing? In that case, we will take you over to the Jungle Queen, a fairy that will give you a tour of Fort Lauderdale from the intercoastal, also called the Venice of America! Our luxury party buses were custom built by professional party bus manufactures with the highest quality workmanship. Most of our Ft. Lauderdale party buses have hardwood flooring, LCD TV’s with satellite service, WiFi, dance poles, wet bars, the amenities you choose, and so much more! Fiber optic lighting helps set the party mood as the road becomes your dance floor! We have access to every party bus on our web site. Not only that, but when you see our fleet, you are seeing the exact party bus that will be picking you up! If you want to go the theme parks in Central Florida, be sure to use Orlando Limo Service. When you visit West Florida, Tampa Limo Service, our sister company can help. Choose your amenities, style, the amount of passengers you want to party with, and the time and date you want the limo bus rental for, and one of our professional chauffeur’s will be there to pick you up and take you safely to your destination! Who needs a designated driver? How about our bachelorette party bus! Let us take the wheel for you so that there is no one friend being left out of the party! What are you waiting for? Call, click, or chat with one of our live chat agents today to get your reservation taken care of!